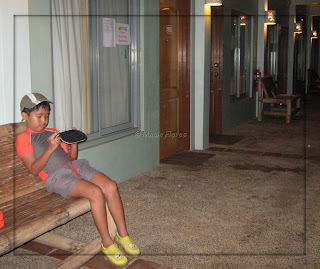 We stayed at the Camayan Beach Resort the night after our day-long tours of Zoobic Safari and Ocean Adventure. 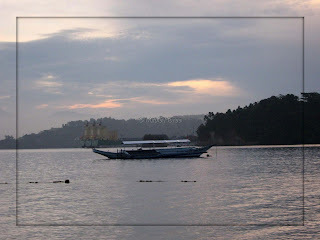 Camayan Beach Resort is the nearest hotel in the area. 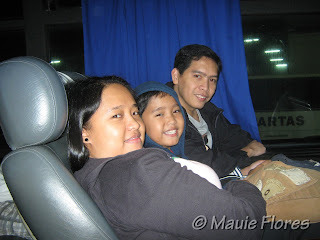 It would have taken us a 20-minute drive back to Subic's waterfront area if we chose to stay at one of the cheaper inns along the boardwalk as we planned earlier. While our room was being prepared, Ralph and I enjoyed the free wifi in the place. 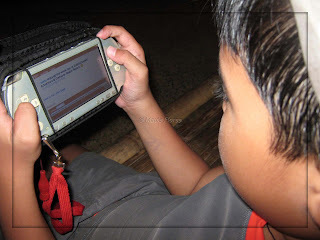 Too bad I didn't bring my laptop so we just had to make do with using the PSP for internet surfing. 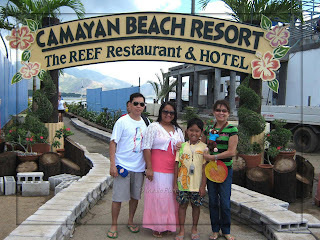 We put our things inside the room and headed on to The Reef for dinner. The Reef is the resort's restaurant. We had Nilasing na Hipon (shrimps marinated in beer then deep-fried) and Chopsuey (sauteed mixed vegetables). The mood that night in the place was festive. 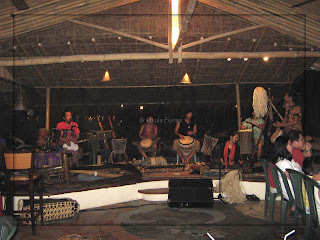 The resident band kept playing tribal-like music. We felt like we were in the set of Survivor with the tiki torches set on the sand just outside the restaurant. 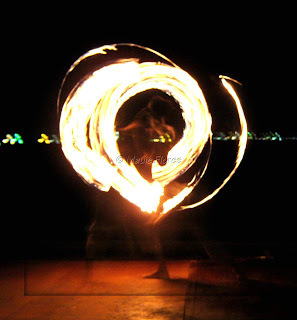 After some time, a fire dance exhibition was done where the tiki torches were. 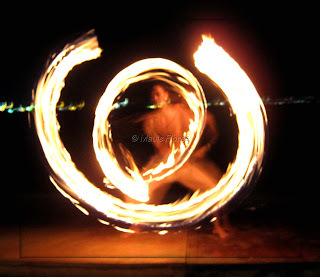 It started to drizzle but the crowd didn't mind getting out to watch the fire dancer up close. Heavy rains poured by the time we got inside our room. We got a deluxe room with two double-sized beds which were just right for the four our us. Ralph slept beside my mother-in-law. I hit the sack as soon as I finished taking a warm shower. My husband and I woke up early the next morning to take a morning dip at the beach. We failed to swim the day before even during our beach lunch buffet. 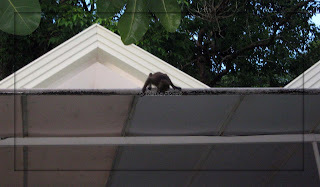 After setting up our things on a plastic recliner still within the hotel area, we saw wild monkeys getting down from the hotel's roof. The monkeys went down from the trees to a trash bin that was just near our things! 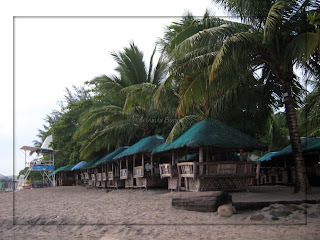 We immediately ran for our things and transferred it nearer to the beach where we were swimming. 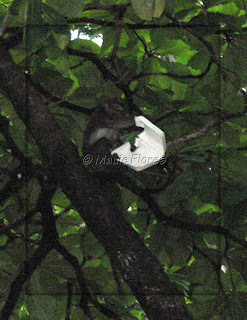 But before getting back to the water, my husband managed to get snapshots of the wild monkeys trashing the place. It was scary and fun at the same time, I tell you! The hotel staff had a busy time cleaning the trash afterward. When Ralph and my mother-in-law woke up, we went back to The Reef to get some breakfast. The breakfast buffet spread that they set up was irresistible so we ended up buying breakfast buffet plates for the four of us. 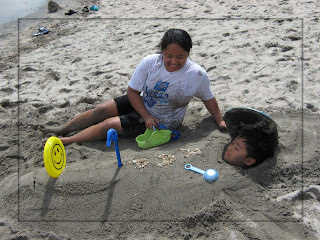 Then, we went back to the sea to play with the sand and to swim. We stayed in the waters until 11 a.m. and checked-out before 12 noon. For more information on Camayan Beach Resort, call their Subic Bay office at (047) 252-8000 or their Manila office at 706-3344 to 46. 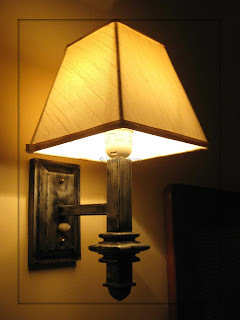 You can also visit this page for online reservations. 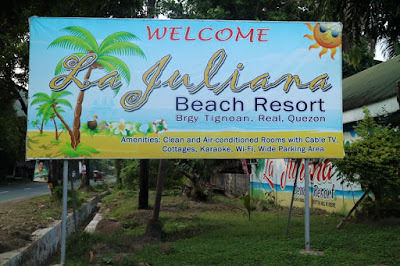 hotels..We offer a BIG PROMOTION with full of packages and benefits.CANYON COVE IS ABSOLUTE PARADISE… IT IS CONSIDERED AS THE BORACAY OF THE SOUTH. sharing the same room. Valid only from Sundays to Thursdays bookings. in to avail of the discount. published rates from Sundays to Thursdays check in excluding holidays. One (1) Complimentary certificate for a welcome drink for one person. Saturdays and Sundays buffet lunch only. certificate may be used per visit. A 20% discount on Day Tour fees, valid for a maximum of 5 persons only. beverage consumables at the restaurant. 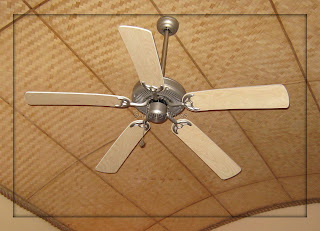 • A 20% discount on Sports facilities and services.HOPE YOU LIKE IT!!!! hahaha, talagang yung outfit ang napansin!